Liza debuted at INTAR in Maggie Bofill’s world premiere, Drawn & Quartered. Other world premieres: Gonzalo Rodriguez Risco’s Dramatis Personae (Cherry Lane Theatre) with Playwright’s Realm, Lisa Dillman’s Ground(Actors Theatre of Louisville), as part of the 2010 Humana Festival directed by Marc Masterson, Tanya Saracho’s adaptation of The House on Mango Street and Jason Well’s Perfect Mendacity (winner of the 2010 M. Elizabeth Osborn New Play Award) directed by David Cromer, both at Steppenwolf Theatre in Chicago. 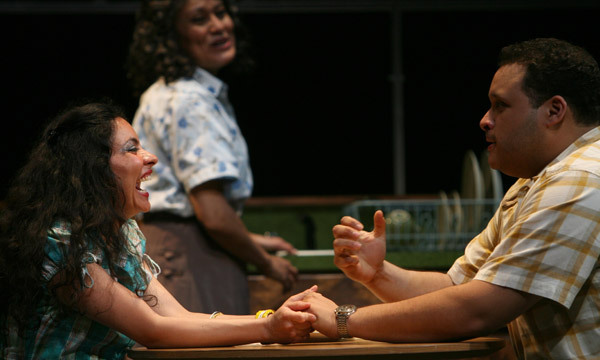 A Midwest premiere: Boleros for the Disenchanted at The Goodman Theatre, by Jose Rivera. Sonia Flew (u/s at Steppenwolf Theatre), The Last Days of Judas Iscariot (Victory Gardens Theater, The Gift Theatre), On The Verge (Remy Bumppo Theatre), Widowers’ Houses (TimeLine Theatre), et al. New York credits: Cowboy Mouth (Producers Club), and Yerma (Circle in the Square Theatre). Tinto (in post production), a 15 minute short (actor/writer/producer credits), and various indies, including St. Paul (Dir. Francisco Ordonez, Best Short ’09 Imagen Awards). She has studied at Circle in the Square Theatre School and Victorian College of the Arts in Melbourne, Australia; she holds a B.A. from SUNY. Liza has been a proud ensemble member of Teatro Vista since 2008.